What’s On the New SF86? The good news is all of the changes are designed to make the form – which has been largely unchanged over the past decade – easier to fill out. Incomplete security clearance applications are still a major issue and one aspect of the myriad reasons for today’s epic delays in processing security clearance applications. With a 690,000 case backlog, it will unfortunately take more than a ‘clean’ SF86 to facilitate a speedy security clearance determination. But if you submit an SF86 with gaps, incorrect addresses and other issues, you can guarantee you’re delaying a final determination. Key changes on the new SF86 are designed to make those errors happen less – from clarifying domestic partnership and marital status to cleaning up the options for providing a phone number (in 1995 who could have guessed that many applicants no longer have a ‘home’ number – just a cell phone). The other key change is simply a clarification – as the ‘legalization’ of marijuana becomes more widespread, the SF86 update specifically notes that individuals must list marijuana use on their security clearance applications. The federal government will still consider federal marijuana policy when it considers the drug use of a security clearance applicant. 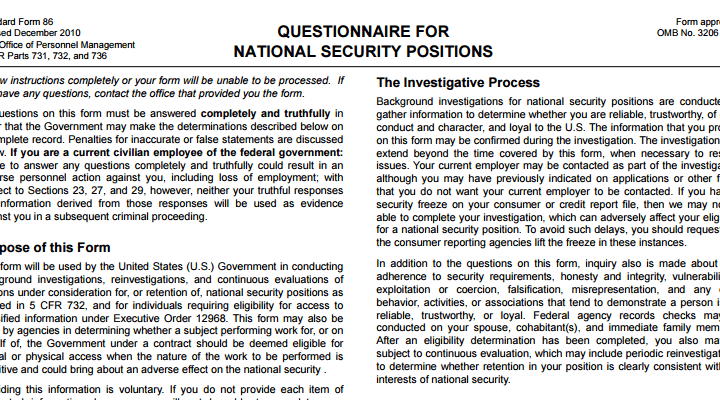 What Level is Your Security Clearance?